COLONIE — There are cheese and step ladder giveaways, hot dog eating contests, fans playing corn hole and slugging beers along the first base line and sugared-up Little Leaguers chasing down foul balls for a bag of Skittles. But, in the middle of all the gimmicks to get people in the stands, on the field there is some pretty good baseball going on at Siena College, where the Albany Dutchmen are calling home for the first time this season. And it’s being played by college kids, from the best collegiate programs in the country, with an eye towards playing in The Bigs someday. The chances of that are near astronomical, but a large banner hanging on the bleachers boast 19 former players who were drafted by major league teams from the inaugural, 2009 season through 2016.
the Perfect Game Collegiate Baseball League as a whole. Most players in the league, he said, are playing in a three-year window when they can’t get drafted according to an odd MLB rule that says players can only get drafted right out of high school, once they reach their senior year or when they turn 21. Once they enter the realm of college baseball, they are off limits for three years. Coach Nick Davey, a Delmar resident in his eighth year with the squad, said the goal of his staff is to develop the natural skills the athletes bring to the table. The Dutchmen are midway through their first season at the newly renovated Siena Field after playing the last five seasons at the College of Saint Rose. As the team settles in, Brinkman said it seems like it’s going to be a good fit. 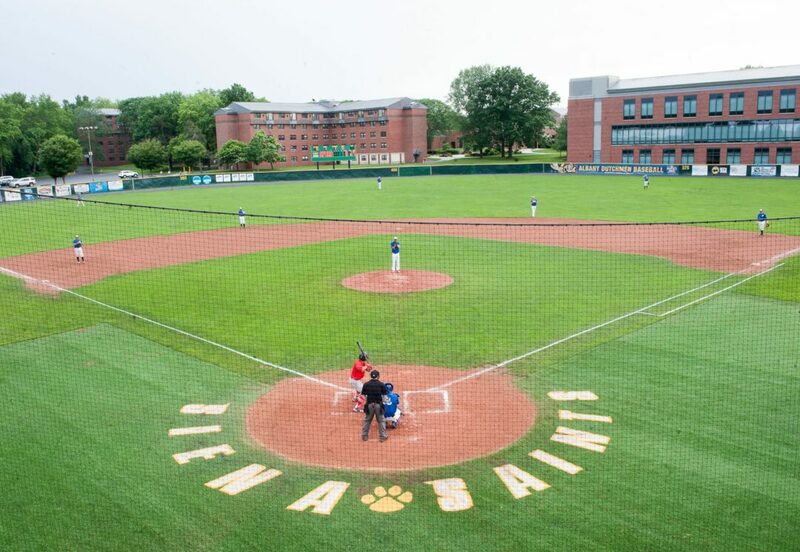 Siena Field had a $500,000-plus facelift that added chair back seating, new dugouts, a new press box, a rebuilt infield and new outfield irrigation system. “We feel that the recent upgrades made have transformed our field into an outstanding Northeast college facility, and one in which the players will enjoy,” said Siena College Vice President and Director of Athletics John D’Argenio at the start of the season. The players are adopted by the Capital District baseball community for two months each summer and part of that is to give something back. Each week the squad goes to Little League practices and clinics or volunteers at events like the Special Olympics, hosted by Siena this year, or the annual Stride Adaptive Sports 5K or other such activities. Little League teams to the park for each home game and the players are announced along with the Dutchmen at the start of the game and run onto the field with them, work as bat boys and play catch with the players prior to the start of the game. “And he plays whiffle ball and video games with us,” chipped in Ryan Sholtz while watching the game from the first base line. Andy Sofranko is hosting Colin Kaucher, an Ohio Dominican player who catches and plays right field, for the first time this summer. Payton Sockwell, a Tennessee native attending the University of North Alabama and staying with a host family in Slingerlands, said upstate New York reminds him of home.